Integrate noCRM.io with FreshBooks and make billing painless when you convert leads into customers. FreshBooks is the #1 accounting and invoicing software in the cloud designed exclusively for self-employed professionals and their teams. 10 million people use FreshBooks to painlessly send invoices, track time and capture expenses. See at a glance how your business is performing with FreshBooks' insightful dashboards and ready-made reports from color-coded breakdown of spending to collected payments. Run your business straight from your phone and work from anywhere with FreshBooks' mobile app. Send invoices, log expenses and snap pictures of receipts while having data synched across all devices. Bill in international currencies and get paid faster with automatic client payment reminders. Manage all of your expenses and stay on budget with FreshBooks' simple expense tracker. Learn more about the features or try FreshBooks cloud accounting software for free. Create invoices and estimates from no CRM in FreshBooks. Attach FreshBooks invoices to existing leads automatically. Use the Lead Clipper to capture lead information from a FreshBooks customer and create a lead in your no CRM account. 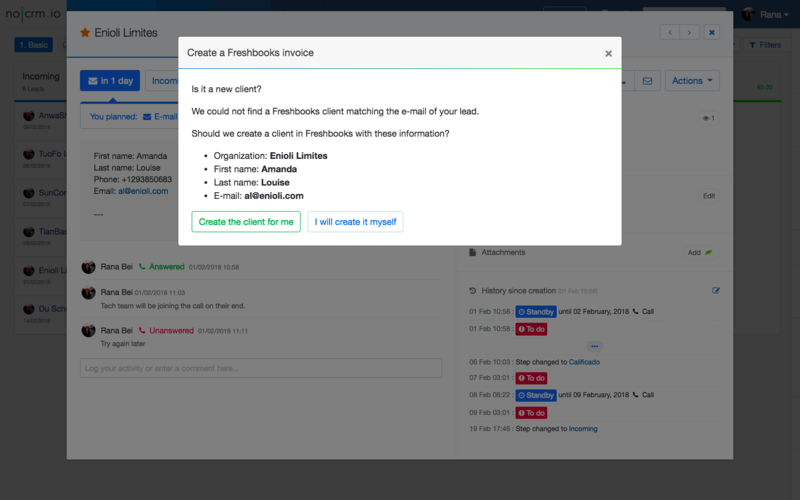 Add new customers in FreshBooks from leads in noCRM.io using the Lead Clipper. Change lead status to WON, move it to the last step in the sales cycle and update deal amount automatically when a FreshBooks invoice is attached. noCRM.io is an easy-to-use lead management system built to help salespeople focus on leads and the next action. Boost productivity and easily create leads from several sources including LinkedIn, business cards, e-mails, and web forms. Distinctively manage cold prospects and hot leads. Don't drop important leads with customizable activities. Login to your noCRM.io account and go to Admin Panel to select FreshBooks. Enter your account name, click on Connect to my FreshBooks account and enter your credentials to make billing painless. For more information on what you can do with our FreshBooks integration, visit our dedicated help page.